In this chapter we will look at the growth of modern palliative care globally from its humble beginnings to finally becoming part of mainstream health care; major developments and milestones in global development, including involvement of the World Health Organization (WHO), the HIV/AIDS Pandemic, the rise of non-communicable diseases, the millennium goals, and now the sustainable development goals; and the World Health Assembly resolution on palliative care. We will explore the current status of palliative care globally and look at future directions and challenges for palliative care to reach its goal of full access to those in need. Gomez-Batiste X, Connor S, editors. Building Integrated Palliative Care Programs & Services. Vic, Spain: Eumo Editorial, University of Vic; 2017. http://www.thewhpca.org/resources/building-integrated-palliative-care-programs-and-services. International Narcotics Control Board. Special report. Availability of internationally controlled drugs: ensuring adequate access for medical and scientific purpose. 2015. https://www.incb.org/incb/en/publications/annual-reports/annual-report-supplement-2015.html. Accessed 26 Mar 2017. Shu-Yu T, et al. 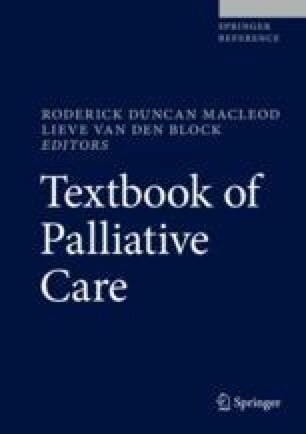 Symptom severity of patients with advanced cancer in palliative care: longitudinal assessments of symptom improvement. BMC Palliat Care. 2016;15(32). https://doi.org/10.1186/s12904-016-0105-8. World Health Assembly. Resolution WHA67.10 – strengthening of palliative care as a component of comprehensive care throughout the life course. 2014. http://apps.who.int/medicinedocs/en/d/Js21454en/. Accessed 10 Mar 2017. World Health Organization. WHO definition of palliative care. 2017a. http://www.who.int/cancer/palliative/definition/en/. Accessed 24 Mar 2017. World Health Organization. WHO model lists of essential medicines. 2017b. http://www.who.int/medicines/publications/essentialmedicines/en/. Accessed 26 Mar 2017.